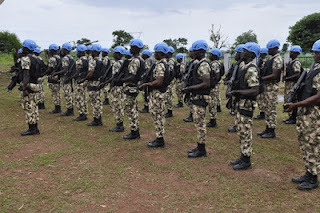 The Chief of the Air Staff (CAS), Air Marshal Sadique Abubakar has disclosed the plan by the Nigerian Air Force (NAF) to deploy additional personnel to the Niger Delta as part of the resolve to combat militancy and other forms of internal security challenges in the region. 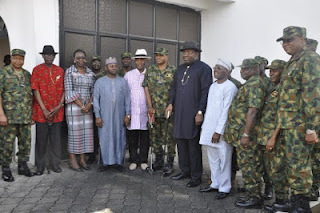 Air Mshl Abubakar made the disclosure in Yenagoa while on operational visit to NAF Mobility Command. The planned deployment is aimed at strengthening the existing NAF manpower disposition, especially in Bayelsa State, and to enhance the NAF involvement in OPERATION DELTA SAFE. Preparatory to this deployment, new facilities were recently put in place to cater for accommodation and other welfare needs of the personnel. These include the construction of new blocks of accommodation for officers and men, office accommodation, airmen mess, and provost squadron, which were commissioned recently. Two of the airmen’s block of accommodation were named after Corporal Omaka VI and Aircraftman Ofonih EF, both of whom were killed recently in Bosso, Niger State during an Internal Security Operation. Air Vice Marshal Larry Koinyan (retired) commissioned the newly constructed projects as the Guest of Honour. Speaking at the commissioning ceremony, AVM Koinyan applauded NAF personnel for their courage and resounding successes brought about by the renewed vigour at ensuring peace and stability in the various theatres of operations across the country, while calling on the Bayelsans to partner with the Federal Government to provide holistic solutions to the problems of the Niger Delta. 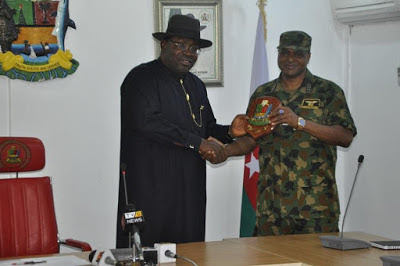 Earlier during the visit, the CAS made a courtesy call on the Executive Governor of Bayelsa State, His Excellency, Rt Hon Henry Seriake Disckson who stated that “his administration is ready to partner with the NAF and other Security Agencies because the Government of Bayelsa understands the importance of security and the need for the State to be safe for economic prosperity”. Governor Dickson also promised, during the project commissioning ceremony, that his government would partner with the NAF to build NAF Primary and Secondary Schools in the State to enable Bayelsans benefit from the quality education provided by NAF Schools with a view to bringing about discipline and reorientation among youths in the State. The schools are to be located on NAF Base Yenagoa.